UFC 236 Holloway vs. Poirier 2 is available to view live on Kodi, although there are notable limitations when it comes to the main event. 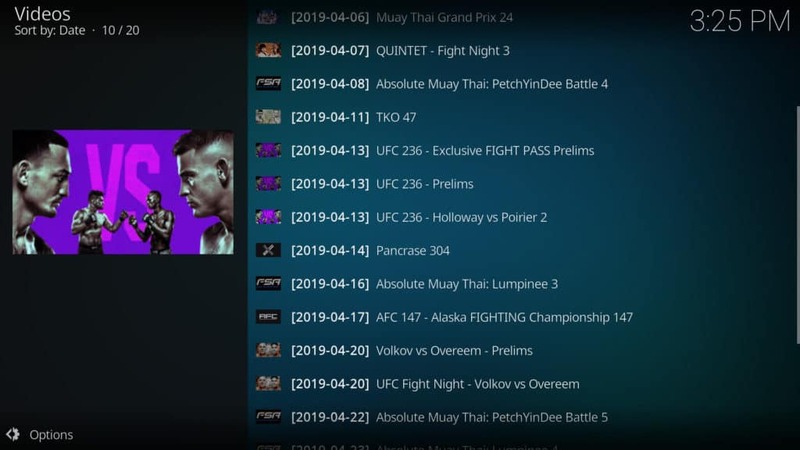 Our guide will walk you through how to get most of UFC 236 on Kodi free. With UFC 236 just around the corner, Kodi users may be scrounging around for effective streaming methods. Are there any Kodi addons that can be used to live stream UFC 236? Yes, but there are limitations. You can use two key addons to watch UFC 236 on Kodi, although you will likely need to use a VPN if you want to see all of the undercard matches, while you may or may not be able to watch the main event on Kodi, depending on your location. If you follow our guide, you may also be able to get most of the event for free, even abroad. Note that our guide will only provide information on legitimate Kodi streaming addons. Popular sporting events like UFC 236 are often locked behind paywalls, including Pay-Per-View models. As a result, illegal streams are will be made available. However, these streams are often poor quality, buffer significantly, and may even cut out during the fight. Many unlicensed streaming websites also contain malware. Official sources will let you watch UFC 236 for free and without risk, so there’s no need to turn to untrustworthy streaming sources. To watch UFC 236 for free, viewers in the US and other locations will likely need a VPN. READER DEAL:Save 60% on IPVanish for fast, private streaming on Kodi. UFC 236 will begin with several preliminary fights, starting April 13 at 6:15 PM EST / 11:15 PM GMT. The main fight card starts at 10 PM EST / 3 AM GMT. First, sign up to a VPN of your choice. For Kodi users, we recommend IPVanish, although ExpressVPN, NordVPN, and CyberGhost are comparable, inexpensive alternatives. Connect to a VPN server in a country where UFC 236 is available to stream. For example, if you’re using UFC Fight Pass, a US or UK server will do, while viewing free through DAZN will require a German VPN server. Try visiting your chosen website or service, or streaming through your desired Kodi addon. It should load almost immediately. We strongly suggest running through the steps above well in advance of when the Early Prelims start. This way, if anything doesn’t work as expected, you’ll still have time to get help from your VPN’s customer support staff and might not have to miss any of the event. Different countries have different streaming sources, but for those looking to watch online, you’ll need to sign up for UFC Fight Pass or ESPN+ to get the preliminary matches. And if you’re in Germany, you can watch the main event on DAZN for free using the free trial option. UFC 236 Holloway vs. Poirier 2 is a Pay-Per-View event in every country around the world where it’s available. However, in most locations, you can get the Early Preliminary and Preliminary matches without paying a dime, and in Germany, you can get the main event for free through DAZN, or at a low cost. Anyone outside of the UK can use UFC Fight Pass and a VPN to watch the entire Early Prelim and Prelim events. However, a VPN will not work to get access to DAZN Germany, so there are no viable options to get the main event through Kodi if you are outside of Germany. At present, there are Kodi addons available for both DAZN and UFC Fight Pass. Unfortunately, DAZN no longer offers a free trial in the US, so if you want to use DAZN to watch for free, you’ll need to be in Germany. At present, there are no VPNs we’ve tested that effectively bypass DAZN’s content blocking for connections from outside of Germany. You will now be able to load UFC Fight Pass streams available to you. Your streams should load in high quality, and according to what we’ve seen, all of the UFC 236 Preliminary events will be available on Kodi through the UFC Fight Pass addon. If you’re in the US, you may want to use this option, as UFC Fight Pass carries all of the Preliminary and Early Preliminary matches in other countries, including the UK. If you connect to a UK VPN server, you’ll be able to use the UFC Fight Pass free trial to get access to all of the Early Prelims and Prelims. UFC Fight Pass offers a 7-day free trial. You can easily access the DAZN addon directly from the official Kodi addon repository. 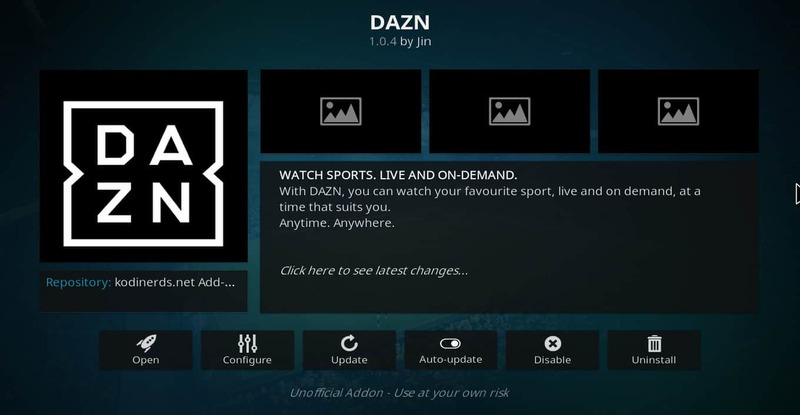 Now you’ll be able to load any available streams from DAZN. The difficulty with DAZN may be that IPVanish won’t bypass the German server, however. If you’re having issues getting IPVanish to access the German version of the site through Kodi, we recommend you utilize the Pay-Per-View options. Note again that DAZN eliminated free trials in the US, so this is no longer an option for US fight fans to get free access to the main event. You can download and install Kodi on the Amazon Fire TV, including the Firestick. The app is not available through the Amazon App Store, so you’ll need to sideload Kodi on the Firestick. Once you have Kodi installed, all of the addons listed above will work, and you can install them on Kodi using the same steps mentioned above. UFC 236 should be available in the US, UK, Australia, Germany, and in more locations abroad. Using a VPN and UFC Fight Pass, you should be able to get access to the entire fight, including the prelims. However, if you’re looking to watch the fight outside of Kodi, there may be a few additional options, especially if you’re in the US. You may want to check out our regular streaming guide for how to watch UFC 236 Holloway vs. Poirier 2 for more details on where and how to watch the April 13 event. DAZN is streaming UFC 229 and all upcoming UFC events for german customers. Excellent and helpful comment, thank you. Adding that in now.